All of the MSG files loaded on to the software can be previewed in a detailed manner with the help of a number of display tabs provided. The application features MSG file contents in hex, property, header, HTML, and other different views. MSG converter provides the facility to perform a selective file conversion by using check or uncheck option. With the help of check option you can select a particular MSG file to conversion and you can remove selected file by using uncheck option. Outlook MSG converter features option to perform bulk conversion of MSG file and you can create a single file for all messages without affecting the meta properties like To, CC, BCC, Sender details, etc. You can perform bulk conversion of message file with their attached file like image, word file, etc into multiple formats with the help of Outlook MSG file conversion tool without any data loss. The software does not affect meta's or document properties (To, Cc, Bcc, date of sent/received, etc) of the message file and keep protected all meta properties in the MSG file conversion process. The software converts whole MSG file with their meta's. MSG file converter tool is originally designed for Windows machine. Therefore, you can easily run this software on Windows 8.1, Windows 8, Windows 7, Windows XP and all lower versions. The MSG file Converter supports different outlook versions such as Outlook 2013, 2010, 2007, and other below versions. The software is compatible with all Outlook versions and easily export all Outlook versions MSG into different formats. 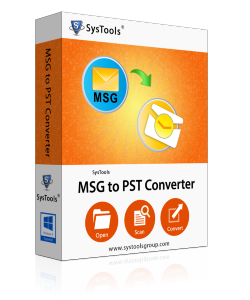 MSG Converter renders solution for the conversion of Single Message Files belonging to Microsoft Outlook for Windows. The solution is rendered for the conversion of message files into a variety of file formats. The application enables users to generate a collective storage of their Outlook messages as well as convert them to other application supporting platforms. A PST file contains way more than just emails and is not message storage. PST files represent a complete user profile. EML is a file extension for an email and file contain message mail With their attachments in plain ANSI format. PDF (Portable Document Format) is a platform independent format and contain text, graphics and other information. MSG files represent a single copy of the message object from an Outlook profile. MSG files are built with an HTML structure. Each copy of the message contains the respective email header, body, attachments (if any). These files can be created by dragging and dropping a message from Outlook message folder. MSG file provides a mechanism to store an appointment, a task, a contact, etc inside a file system. MSG file represented five storage elements: Recipient, attachment, message, custom attachment, named property storage.